Visited Okayama to meet a client. Before the meeting, we visited Kurashiki Bikan historical quarter, where historical Japanese architectures preserved as they were from 17th century. It was raining, but was not that hard as we could even enjoy it during our taking walk. 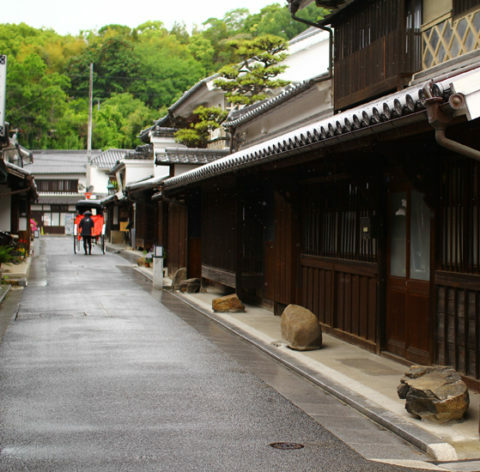 Rain and Japanese traditional architecture harmonize well. Glossy roof tiles and greenery looks more lively without blue sky, and the contrast of them are beautiful. Even the usual asphalt paving harmonize well in this scene somehow. One day, we wish whole Japanese city take such beautiful scenery back…..
Photo: A corner of Kurashiki Bikan historical quarter, Kurashiki city Japan.